Recap of MoFRW State Convention held June 5-7 in Blue Springs. Headlined by Sen. Roy Blunt, Lt. Gov. Peter Kinder and MRP Chairman John Hancock. A spirited, involved and dedicated group of women, the Missouri Federation of Republican Women, held its annual State Convention in Blue Springs June 5 to 7th. The event featured Sen. Roy Blunt, Lt. Gov. Peter Kinder and Missouri Republican Party Chair, John Hancock. A grand gathering indeed of Republican Women at MoFRW State Convention! MoFRW Annual Convention informs and connects Republican women from around the state as they meet annually hearing from officials and candidates and preparing for the statewide and national election year ahead. Senator Roy Blunt, Lieutenant Governor Peter Kinder, and Missouri Republican Party Chairman, John Hancock headlined the MoFRW State Convention in Blue Springs. Each gave insightful and informative talks. Additionally, MRP Chair John Hancock entertained the crowd with his rendition of delightful ragtime piano tunes. Several local officials and statewide candidates also gave brief talks. "Reclaiming Our Heritage, Forging Our Future" was the theme of the Missouri Federation of Republican Women's annual state convention in Blue Springs June 5-7. The convention was hosted by the MoFRW 5th Congressional District with clubs in Jackson and Lafayette Counties. The purpose of the convention was to transact any federation business that may come before its members. Delegates and alternates are elected from each club, and all members and guests are invited to register and attend. The goal of the 5th District was to provide a convention that informed the ladies, made them feel more connected and provided some fun. • Darla Jaye, radio talk show host of The Darla Jaye Show on Talk 980 AM airing at 5 to 9 AM weekdays. • Brittany Wagner of St. Louis Young Republicans. • Joyce Mucci, field representative for the Federation for American Immigration Reform. • Mary Jefferson spoke on "Eisenhower: the Forgotten President". • Carrie Almond, National Federation of Republican Women second vice president. Note: our own Lana Crain, Lafayette Country Federated Republican Woman's Club president, served as the 2015 MoFRW state convention chair. We are proud to say she planned and executed a superb convention. Congratulations Lana on a job well done! Below is a photo recap. 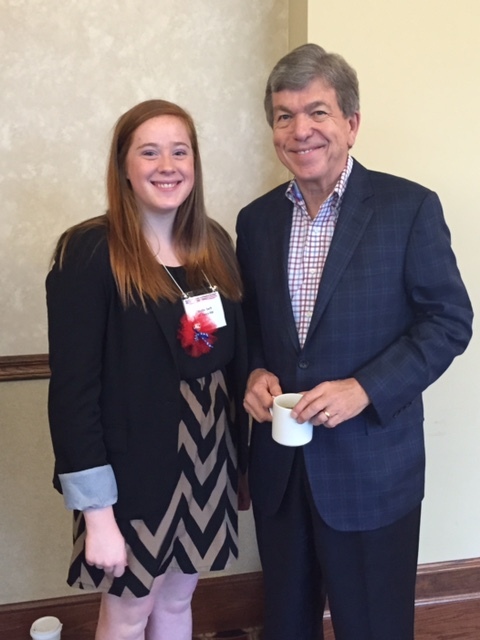 Senator Roy Blunt greets Molly Katherine Swift, the 5th District Breckenridge Scholar recipient for 2015. Senator Roy Blunt addresses the convention. Senator Blunt had everyone's rapt attention as he spoke to the group. He jokingly asked how long he should speak, and someone remarked--we could listen to you all day. Blunt presented an overview of issues that affect the United States of America and its citizens, and he also kept the group laughing with a bevy of fun and humorous stories. The ladies were honored to have Senator Blunt attend and thanked him for his service to the State of Missouri. MoFRW President Tane' Schwartzman introduced Missouri Lt. Governor Peter Kinder who discussed a number of issues that concern the State of Missouri including the recent Right-to-Work veto by the governor. 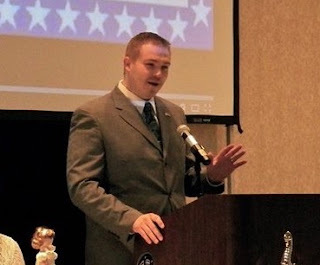 John Hancock, chairman of the Missouri Republican Party, gave a rousing speech Saturday night at the MoFRW State Convention banquet and explained the pathway forward that will be necessary to win statewide elections in 2016. He also noted how important it is to re-elect Senator Blunt as well as help the country elect a Republican president in 2016. MoFRW President Tane' Schwartzman is pictured on the right. During Chairman Hancock's speech, he played some ragtime piano tunes that left everyone wishing for more. Mayor of Blue Springs Carson Ross welcomed the convention delegates, alternates and guests to the City of Blue Springs, saying how proud and happy he is that the 5th District FRW chose his city for their state convention. 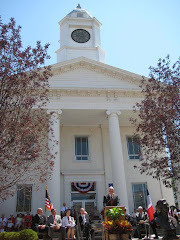 Chris Lievsay, Blue Springs City Councilman, and Jackson County Republican committeeman, encouraged everyone to visit Blue Springs while they are in town for the convention and brought a warm welcome from the City Council. Popular Kansas City talk 980 AM radio personality, Darla Jaye, entertained the ladies with a powerful talk as only she can. Thanks Fifth District FRW member, Mary Jefferson, First Ward Federated Republican's Women's Club, for her great informative presentation on Eisenhower: The Forgotten President, at the Missouri Federation of Republican Women's state convention in Blue Springs, June 6th. 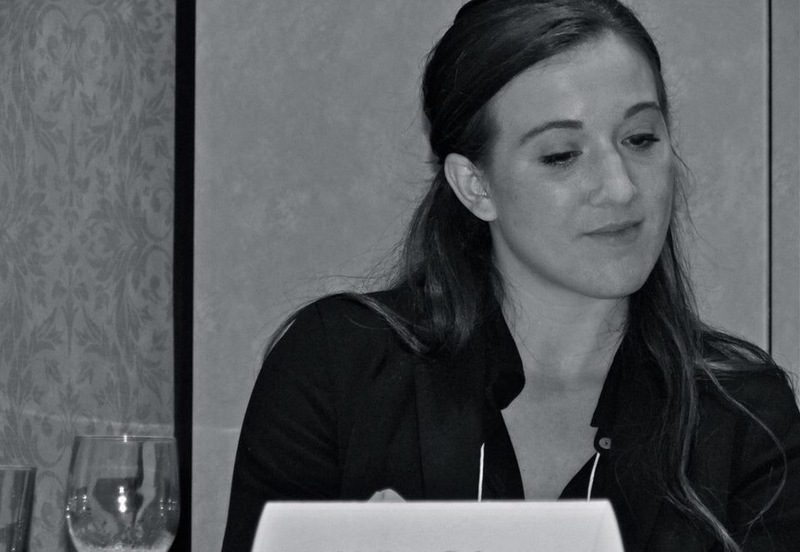 Brittany Wagner, representing the St. Louis Young Republicans spoke on plans State YR's have to help win in 2016. Angie Stiffler was installed as the new president of the Missouri Federation of Republican Women. She is a member of the First Ward Federated Republican Women's Club in the 5th District. From left: Jacque White, Secretary, Nancy Johnson, Treasurer, Barbara Smith 2nd VP, Jan DeWeese, 1st VP, and Angie Stiffler, President. Lafayette County's FRW own, Emily Kolkmeyer Wilson and her mother Lisa Kolkmeyer, designed and decorated beautiful table decor for the conventions luncheon and banquets. Lovely job ladies! Mary Potter, Missouri Republican of the Year, and Mark Anthony Jones, chair of the Jackson County Republican Central Committee and chair of the 5th Congressional District. MoFRW President Tane' Schwartzman, left, presents the Diamond Award, the highest category state award, to Lafayette Country FRW represented by Lana Crain (right), president of Lafayette County Federated Republican Women. A goodie bag presented to convention attendees by the Federated Republican Women of Lafayette County. 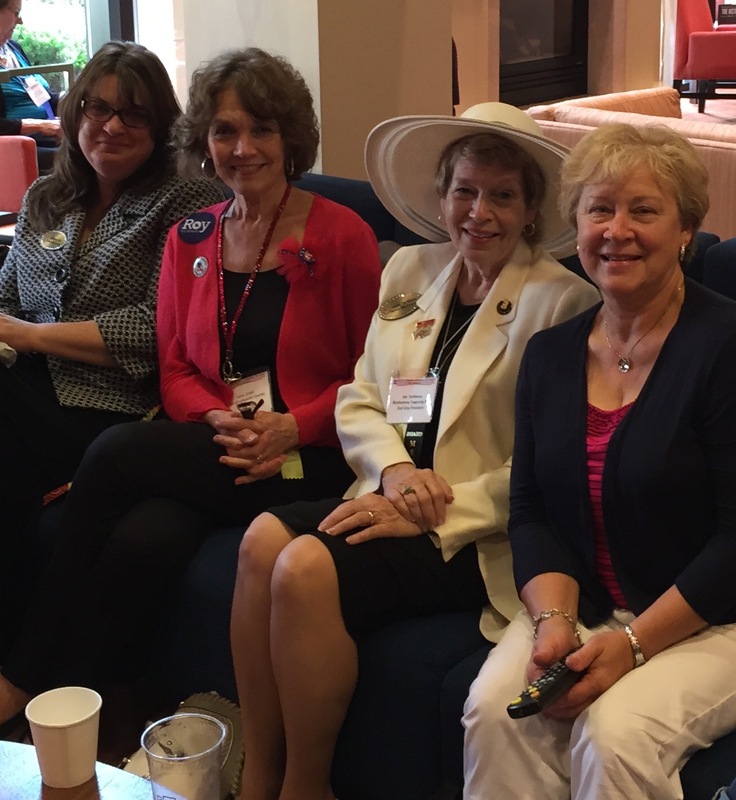 Past MoFRW Presidents, from left: Violet Corbett. Carrie Almond, Kathy Chinn, Kathy Drake, and Barbara Cooper. Program speaker, Joyce Mucci, Field Representative for the Federation for American Immigration Reform. State Rep. Sheila Solon, District 31, welcomed the group to Blue Springs, which makes up a large part of her house district. 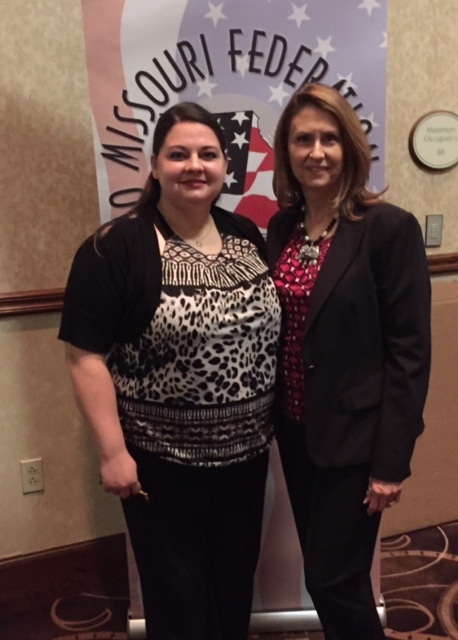 Pictured on the left is Angie Stiffler, new president of the Missouri Federation of Republican Women. Frontier Justice of Lee's Summit presented a fashion show featuring some of the products and clothing they sell. Frontier Justice is a next-generation firearms facility and shopping destination. Frontier Justice is equipped with a firearms and archery training facility, firearms and archery retail, and a gunsmith, along with a café, women's and men's clothing, jewelry and home furnishing retail. Frontier Justice believes strongly in traditional American values and leads the way to MAKE A STAND for faith, family and freedom. For more information about Frontier Justice (a firearm equipment, training and apparel store), visit this site: http://www.frontier-justice.com. Century Club is a group of MoFRW donors who donate funds for a "reach-out and teach initiative", which educates and informs women voters, provides women with increased opportunities in governmental leadership roles, and helps educate Republican candidates. It is a foundation on which the MoFRW builds for the future. Modeling Poodle skirts at the Century Club event: Judy Wales, Ruth Pirch and Virginia Robbins. Betty Allen admiring Bev Worth's 1957 T-Bird at the Century Club event. (with Bev and Ray Worth's 1957 V-10 T-bird). Chris Lievsay, Eloise Ross, Mayor Carson Ross, and Susan Culpepper, Blue Springs City Council member. and chair of the 2015 MoFRW Convention. Lisa Kolkmeyer, second vice president of Lafayette County FRW and wife of State Rep. Glen Kolkmeyer (District 53). and Doris Strickler, club secretary and central committeewoman. WATCHING THE BELMONT STAKES WITH HATS AND MINT JULIPS, OF COURSE! FROM LEFT: Melissa Cole, Membership Secretary; Lana Crain, Convention Chair; Jan DeWeese 2nd VP; and Kathy Drake, past MOFRW president.